Discussion in 'Star Style' started by ParadEyes, Jul 6, 2009.
her style definitely deserves a thread. Unlike many other monarchical wives in the Middle East, Sheikha Mozah has been a high-profile figure in her nation's politics and society, actively involved in Qatar's government. She has been named as one of Forbes' 100 Most Powerful Women at #79. French Prime Minister Francois Fillon and his wife Penelope receive Qatar's Emir Sheikh Hamad Bin Khalifa Al-Thani and his wife Sheikha Mozah Bint Nasser Al Misnad (wearing Stephane Rolland), at Matignon, in Paris, France on June 23, 2009, on the second day of the Qatari royals state visit to France. 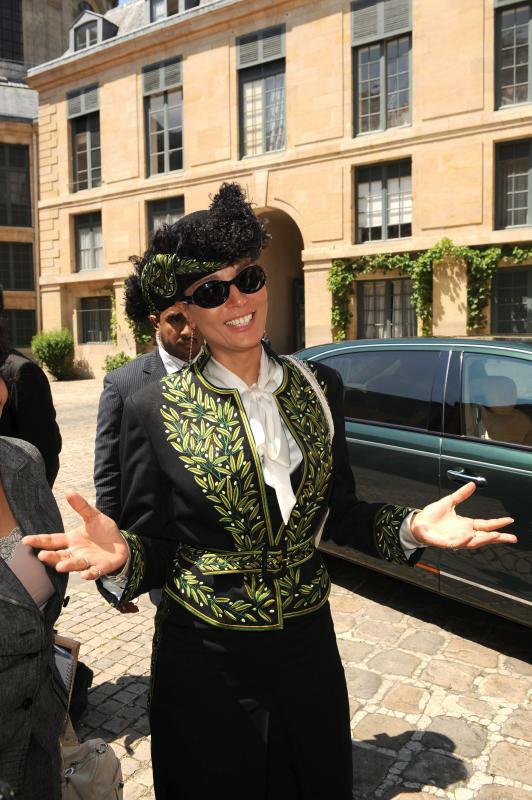 Qatar's Emir's wife Sheikha Mozah bint Nasser Al-Misnad seen arriving for a lunch at the Senate, Palace of Luxembourg, in Paris, France on June 23, 2009. 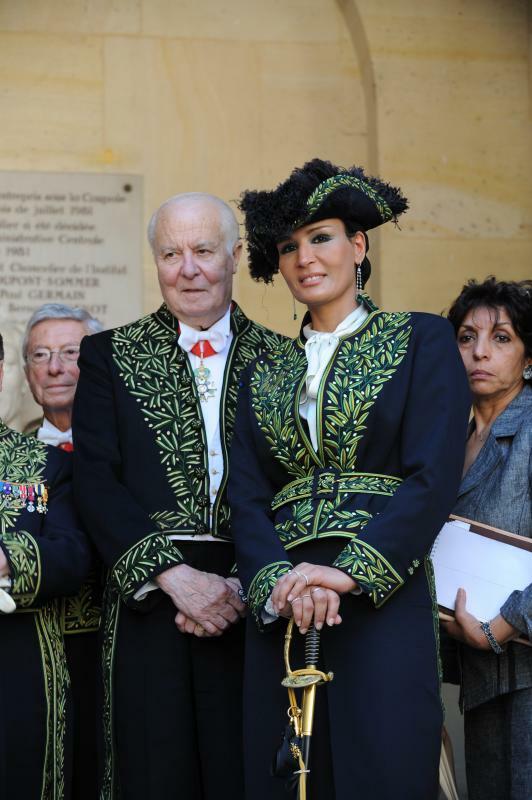 Qatar's Sheikha Mozah Bint Nasser Al Misnad inaugurated as permanent member of the Academy of Fine Arts of 'Institut de France', in Paris, France on June 24, 2009, on the last day of her state visit to France. I love her style! Keep the pics coming. So far the ones posted I hadn't seen before. Qatar's Emir Sheikh Hamad Bin Khalifa Al Thani (2nd R) and his wife Sheikha Mozah bint Nasser Al Missned (R) are welcomed by France's President Nicolas Sarkozy (L) and his wife Carla Bruni-Sarkozy before a state dinner at the Elysee Palace in Paris, June 22, 2009. 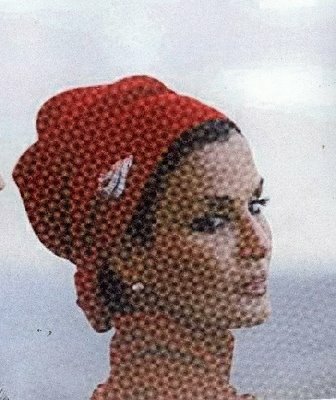 I think we have a thread on her already, because I remember her awesome use of turbans. The green is spectacular - was that recent? She obviously has amazing style - she does the grecian/flow-y look SO well. I'll double-check to see if we do have that older thread. I did list all the accounts' names..maybe I should've used dashes instead of comas to make it more clear. About the green outfit, she wore it during her visit to France in July 14, 2008. She wears some amazing couture pieces. Just at the moment eternityg. talks about Middle East in Givenchy HC, I wanted to know if Cheikha Moza was attending Couture this week. Looked for a thread onto here and saw you just opened one ! She seems to be a very nice woman ! And she's done a lot for women in Qatar, non ? And she founded Education City !!! She's basically doing a lot for education which is great ! Yes, she has done a lot for education not only in Qatar.. in other Middle-Eastern countries too. 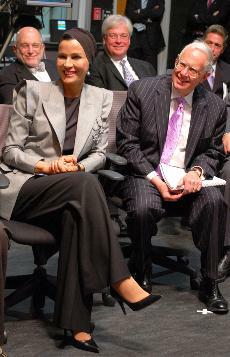 She launched the Al Fakhoora Fund which aims to raise $200 m to rebuild the educational institutions in Gaza, Palestine. She also distributed hundreds of scholarships for Iraqy and Palestinian students to pursue their education in Qatar (Education City) or any other part of the world. I've met her during my graduation, and I admit she looks much better in person than in pictures. She has such a graceful, powerful presence! It's good to know that she actually cares about people instead of just spending money and doing like most other royalty do...and you are so lucky to have met her! Isn't Sheikha Mozah the epitome of elegance? Lovely. Absolutely stunning, always. There is also a new plan by her highness to establish a Fashion House. I know two Qatari designers working in the project for now with a couple of French designers. I don't know much about it, but it is supposedly the first in the region.